Stuck with poor quality Oh and Ah samples in your virtual instruments? 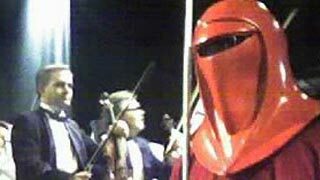 Yesterday I have been at a live concert with music from Star Wars. Sheer pleasure, I might add. The arranged music is surprisingly enjoyable as a concert piece and John William's Mastery never ceases to amaze me. However, during the performance, I had an idea for a small tutorial. In virtual music, having a chance to look at the performers often gives unexpected hints. The chorus performed both Duel of the Fates and Battle of the Heroes, which is Anakin and Obi Wan's battle. I realized that most of the text in Battle of the Heroes is just Ooohs and Aaahs, that's to say the rather limited range of vocals available in lower-end virtual instruments. I decided to try out what could be done with MOTU's Symphonic Orchestra: follow me in this experiment. To write the choir's part, select the midi track and click on "Piano roll view". After selecting Draw, insert an A3, then a Bflat3 and then three B3. These are three among the highest notes that this choir can play, it's a mixed choir with an extension between C1 and C4. Such an high register will help us creating a tense mood. This is the result: pretty limited. The last note repeated three times sounds fake and mechanical. It's the so called machine gun effect, where a repeated sample breaks the illusion of reality. Another problem is that with such an high tone, we hear only part of the choir. Sopranos and Tenors, because Bass and Altos can't sing so high. This means we are wasting our virtual instrument - cutting it in a half. A first solution would be to add to the first note -A2- an A from the lower octave, that's to say an A1. This way we would hear Bass as well. We could do the same with the other notes, adding to the Bflat3 a Bflat2, and to the B3 a B2. However, the result would still be flat and unrealistic. The truth is that real choirs voice's don't sing the same note at the same time. We'll rarely hear basses singing E2, Altos E3, Tenors E4 and Sopranos E5. That would be a schedule, not a score! The way a choir sings, is much more like a chord. A chord is made up playing two or more notes at the same time. In our case, we add to the first note -A3- another lower yet different note, for example a C3 and yet another one, say an E3. The three notes used at the beginning are now three chords. There are rules for this, you know: Harmony. But for this quick tutorial we'll skip theory and try to get something that sounds -if not good- at least better than what we had at the beginning. And by using these simple chords, the virtual choir does sound better. We are tricked into thinking that each singer has his or her own part. Mind you this is a fake: we are still using the whole 4 voices choir sample for each chord. We can't appoint some notes to some singers. This means that if I choose three notes that can be played by all the sample's voices, my choir will suddenly become three times as large! But again, for production music the Symphonic Choirs and the Voices of the Abyss are the de-facto standard. I'm trying to show you what can be done with limited resources and a bit of ingenuity. And here's the deal: adding a little background will hide most problems. Let's add a midi track, and assign some strings to it. Tremolo strings are great to create tension, and they also fill in the choir's thin sound because their sound varies quickly - but still plays the same note. Again, let's start with the same three notes used for the choir (A-Bflat-B) and add chords to enrich the sound. Chords are the same, but we are going to have a much larger range now. With the samples I used the choir's extension was between C1-C4 while the strings ensemble had an E0 - Csharp6 range. I added a few extra notes, E4 and A4, to bring up the rhythm. Fudge the bars a bit, until the chords sound well tied together, then syncronize both the choir and the orchestra moving the notes until they match. This is the final result of the strings part. I think it does. BTW, Sopranos are able to sing much higher than the C4 these samples are limited to. Different samples would allow to reach C6. Also, in the "Mixed Choir Ahh" sample from MOTU Symphonic Orchestra, voices sing the same note at different octaves. So if you play a C4 on the keybord, you'll hear Altos singing C4 but also Sopranos singing C5. Don't ask me why.